In Part 1 yesterday, I ranked the Top 20 position player prospects in the Twins system. These rankings were done after I returned from Ft. Myers for a week of spring training, conversations with several people in and around the organization and other factors. In Part 2 today, I will add my rankings of the Top 20 Twins pitching prospects, so be sure to come back and ask as many questions as you would like. As a reminder, the purpose of prospect rankings is really just to create discussion. Below you will find my personal rankings of Twins pitchers, and I certainly welcome your thoughts and opinions on the players and their rankings. Drafted in the fourth round out of Clemson in 2017, Barnes spent the 2018 season in Ft. Myers where he went 6-6 with a 2.81 ERA. He ended the season strong. In his final 13 starts, he went 5-2 with a 1.84 ERA. He doesn’t throw real hard, topping out just over 90 mph, but he has a plus changeup and mixes well. Ober was the Twins 12th-round pick in 2017 out of the College of Charleston. In his first start last year with the Kernels, he gave up six earned runs in 2/3 of an inning. He gave up four or more runs in five of his first six starts. Then over his next six starts, he went 6-0 with a 1.66 ERA. He also struck out 63 batters in 48 2/3 innings in that stretch. However, he left that final game in late July with an elbow issue that was deemed minor. Injury has been a big part of his pitching career but when healthy, he has been really good. The Twins took the right-hander from Canada in the second round of the 2017 draft. He is still pretty new to pitching and the Twins are being incredibly patient with him and his development. But watching him throw bullpens is impressive. He throws hard. He had onlookers to his bullpen asking who he was and how soon he would be in the big leagues. Well, it’s going to be a while, but when healthy and ready to go, he could be impressive. But, at this point, we just don’t know yet. But he’s got the big size and strength to be one to watch. Jovani Moran has been really good the last couple of years. 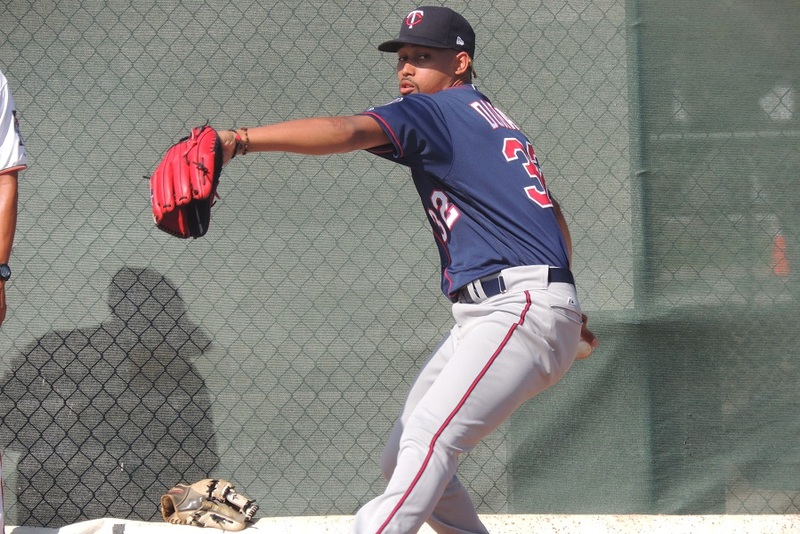 The Twins seventh-round pick in 2015 out of Puerto Rico. He missed 2016 after having bone chips removed from his elbow. He dominated in Elizabethton in 2017. In 2018, he was really good in both Cedar Rapids and in Ft. Myers. Combined, he went 9-3 with a 2.25 ERA. He had 107 strikeouts in 76 innings. Many that watch him wonder “What is that pitch?” He’s got a few pitches and gets a lot of movement. When Sands makes his first Kernels start this year, on Saturday, it will be his professional debut. After his 2018 season at Florida State, he was just shut down and didn’t pitch after being the Twins fifth-round pick last year. I saw him pitch a couple of times in Ft. Myers this spring and came away impressed. He’s big and strong and can throw pretty hard, but there appears to be room for more which is what’s really exciting. Winder was the Twins seventh-round pick last year out of Virginia Military Institute. He’s also tall and built quite strong, but like Sands, there is room for some growth and increased velocity. He went 3-1 with a 3.72 ERA in nine starts for the E-Twins. In 38 2/3 innings, he walked just six and struck out 42 batters. Littell came to the Twins from the Yankees at the July 2017 deadline for Jaime Garcia. He reached the big leagues earlier in 2018 and made one start. Later, he got a relief appearance. Neither went well, but he was called back up in September and showed well in his final appearances. Littell is strong and he has three good pitches and pitchability. Rijo came to the Twins at the July trade deadline with Tyler Austin in exchange for Lance Lynn. He was pitching for the Yankees Appalachian League team in Pulaski at the time of the trade and was 3-1 with a 2.67 ERA in five starts. He made five starts for E-Town and went 2-0 with a 1.27 ERA. He has shown good control and struck out a little less than a batter per inning. Rijo stands just over 6-feet tall and is stocky, but he does know how to pitch. It was a bit of a surprise last year when it was Stewart that was called up first in mid-August. He held his own in the big leagues, pitching well at times - particularly against the Tigers - and also struggling, as you would expect a guy in his first month or so in the big leagues. He begins this season with the Red Wings. He has really matured, but he’s also got good stuff. He has good movement on his one-seam fastball which induces weak contact. His other secondary pitches will need to continue to be more crisp but have some potential. Grace was the Twins 10th-round pick a year ago out of high school in Mississippi. He is physically impressive. He stands tall and is built very strong. He’s got the Graterol-like lower half with strong legs and back side. He really drives off the mound and despite his youth has a big fastball. He has a world of potential and time to continue developing his secondary stuff and learn how to pitch. Jax is tall and thin but very strong. In April of last year, he learned that he would be able to put his efforts to baseball. He did well with the Miracle and then was able to pitch in the Arizona Fall League. He is making the jump to Double-A this year. He’s got a good fastball and an improving slider. He’s got good pitchabilty. Wells was the Twins Daily choice for 2018 Starting Pitcher of the Year when he went a combined 10-6 with a 2.49 ERA between Ft. Myers - where he was a Florida State League All Star -and Chattanooga. In 119 1/3 innings, he struck out 121 batters. Wells stands 6-8 and has really worked hard since becoming a pro, losing about 50 pounds. He’s got a good fastball and the secondary pitches have really improved. He starts the season on the injured list, but he should be just a couple of weeks behind. Alcala came to the Twins in the Ryan Pressly deal from the Astros. He’s got a big fastball, sitting in the upper-90s and occasionally hitting triple figures. Questions remain with his secondary pitches, but the arm should play in the bullpen even if he isn’t able to develop a third pitch. Colina has quietly become one of the best pitching prospects in the organization. He isn’t real tall and has a stocky build and is very strong. He was really good in Cedar Rapids last year and earned a promotion to Ft. Myers where he pitched a huge game late in their season and then was the starter in the FSL championship game. This spring, he was hitting 97-98 mph with his fastball and still has the secondary pitches that have potential. While his MLB debut late last season didn’t go as well as hoped, Gonsalves still possesses a plus changeup. He has a much-improved curveball and a cutter. His fastball velocity last year was down under 90 and he seemed to lose his control and command. There were reports of increased velocity shown at spring training, and if he throws more strikes, he can be successful in the big leagues. He expects to miss the first two or three weeks of this season. Balazovic’s name became much more talked about after Keith Law named him the Twins #3 prospect this winter. But Balazovic has been an intriguing prospect since the Twins made him their fifth-round pick in 2016 out of a high school near Toronto. He had a nice debut, but he really struggled in the GCL in 2017. Things really came together for him in 2018. Drafted for his size (tall, thin) and pitchability, he gained a lot of velocity since being drafted and now sits in the 93-95 range. He still has the good secondary pitches too. He had a nice showing when he went 7-3 with a 3.94 ERA in 12 games (11 starts). In 61 2/3 innings, he walked just 18 and struck out 78 batters. Enlow was the Twins third-round pick out of high school in Louisiana in 2017. He pitched well in Cedar Rapids in 2018. He went 3-5 with a 3.26 ERA in 94 innings. He’s got good velocity, hitting 93 and even 94 at times, but he’s best known for his spin and his breaking ball. He returns to the Kernels - where his Opening Night start didn’t go great. But that’s one start and Enlow has the size, athleticism and willingness to learn to be really good. Thorpe was the Twins choice for pitcher of the year last year. After missing two seasons after Tommy John surgery and disease, he returned for a half-season in 2017. He worked 129 2/3 innings in 2018, mostly at Chattanooga, but he ended the season with four starts in Rochester. Thorpe sits in the low-to-mid 90s with a good curveball and a good changeup. He should debut in 2019. Duran came to the Twins last July from Arizona in the Eduardo Escobar deal. In his first start with the Kernels, he threw seven no-hit innings. He was flashing a fastball in the 95-96 range and showed what potentially could be really good breaking pitches and a changeup. He gets good movement as he will. I’m sure you saw LaVelle Neal’s tweet saying that Duran hit 102 last week in Ft. Myers. More consistently he’s been hitting 97-98 mph. Graterol missed nearly two seasons with Tommy John surgery, but he returned in 2017 and was very strong. He had gained about 60 pounds and his velocity shot up to nearly triple digits. In 2018 in Cedar Rapids, he hit 100 many times and usually had a 102 a few times each game. Watching him in the bullpen, he has the makings of a plus changeup and a plus-plus, wipe out slider. Development of those pitches will be the key in determining his future (starter or reliever). With his aggressive promotion to AA to start this season, don’t be surprised if he finds himself in the Twins bullpen late in the season. Again, these are my personal choices as Top 20 Minnesota Twins pitching prospects. Certainly this list can and will likely cause some discussion and questions, which I welcome below. That is a good list.Some nice young pitching in that top 20.Only change I might make is swapping Ober for Stashak.Cody has been pretty lights out as a reliever and I expect him to dominate again this year.Even Eades could be in this list somewhere but I guess when there are only 20 slots it gets hard to pick and choose who you like for those final spots. Thanks for putting this together it is nice to see what we have for pitching in the system. I am looking forward to Thorpe's season this year.I hope he can improve off his nice year last year. But outside of Thorpe and Graterol control looks to be a problem for these big arm guys.And if the Twins see Graterol as a bullpen arm, pitching could be an issue down the line. Better pay Berrios and make some more trades. If the top five can finish off their pitches and command this bodes well for the future of the Twins rotation. Every level appears to have strong starting candidates, which hopefully means that every year we have have an additional 2-3 strong pitchers to continually grow the pitching staff. It is surprising to see that 3 pitchers who started games for the Twins last year and are in consideration for making starts at some point this year can't make the top 5. The bullpen thing would be if the Twins are competing for a playoff spot and hes' approaching an innings limit or something. I guess he's had too many major-league innings to be a "prospect," but has everyone completely given up on Romero? Over the last two years he has been the "next big thing" and now all of the sudden I don't see any mention of him. I don't think anyone has given up on Romero. Well, I guess the Twins gave up on him as a starter, at least for now. But, like you said, since he no longer fits under the "prospect" classification, he wouldn't be mentioned here. You can make the argument that the bottom 5 of this group all have a real chance of someday playing in the bigs.I don't know if you could have said that a few years ago or at anytime I can recall.Really like the depth that has been added to this system. One name I don't see and wouldn't expect to see is Benninghoff.Did you see anything of him this spring?If so, what does he look like and where is he headed this year? Having Enlow make the start for Cedar Rapids last night is an indication the organization thinks highly of him.The results weren't good.Do you think it was opening night jitters?Or could have been that this his first game ever pitched in a cold climate? I'd put that southpaw the Twins just got from the Mets, Sidd Finch in the top 10 on this list. I read he was consistently over 100 mph with his pitches, but is a bit eccentric and has been out of baseball a while, before coming back around the first of April this year. They all have their faults/opportunities/things to work on and they are still young.They are all pretty much the same age.Stewart has been the most effective and Thorpe the least (injuries etc do count - ask Jason Kubel if you don't believe me) and his staff has been going the wrong way, unlike the others.Littell and Gonsalves are very similar pitches with Littell getting the node because he is younger. Other than that, I pretty much agree. Any word on Dakota Chalmers whom the Twins got from Oakland for Fernando Rodney? He had Tommy John surgery a year ago. He was throwing 96-97. Bar in Alston said he could be a fast mover in the system if he made a couple of adjustments. He definitely defines lottery ticket (and had some maturity issues). I assume he is in extended spring training. I saw Benninghoff in a bullpen and in a game. I thought he looked good. He's got a great frame for a pitcher. I think at this point it's going to be about working on things like command and sharpness of pitches and stuff like that. I think he's got a chance, but patience will be key. I don't think that the Opening Day start really indicates anything about how the organization feels about Enlow. I mean, it's a nice thing, but that alone isn't indicative of anything. I mean, all due respect to Bryan Sammons, who is a good pitcher, but Jhoan Duran is the top prospect with the Miracle. As for his struggles, I'm sure it was several things. He did pitch last year for the Kernels, so he's pitched in the cold before. But it definitely wasn't real nice. I think he was just struggling with his control. He walked one in each of the first innings and probably just missed a spot on the homer. In the third, it was just a ball that started rolling and he wasn't able to work out of it. Based on when he had Tommy John surgery, he should just be playing catch and maybe just getting to his first bullpens now. I didn't see him throw a bullpen. Not sure I can add anything more than what's in the prospect handbook on him. I think Lachlan Wells had his surgery a little earlier than Chalmers. Wells was throwing his second or third bullpens when I was there. He actually looked to be doing real well. But that again tells me that Chalmers is probably just getting to that point now. I think Kohl Stewart is going to take the next step this year and become a solid major league pitcher.Just a feeling.Slow to develop, but keeps working and getting better.I don't disagree with the current ranking (because what do I know) but I'd bet he moves up a ways by the end of the year. And if he doesn't because a bunch of other guys improved a lot I'm ok with that. I have that same itch many days......I'm just not as sure as I'd like to be. Alcala won’t stay a starter. He just doesn’t have starter consistency. Could be a great bullpen guy though. If Alcala is still in a starting role by september I’ll buy everyone a beer. Enlow had a very rough opening night. Hopefully he gets it together. I think he’s a bit over ranked if I’m being honest. Still shocked Poppen isn’t in this mix. Wells is very underrated but Poppen takes the cake for no love. Barnes and Moran are my ones to watch. Really like Moran in the pen. Still shocked Poppen isn’t in this mix. Wells is very underrated but Poppen takes the cake for no love. I am just baffled at how Romero has gone from our Top starting pitching prospect last year, to a call-up that had a scoreless inning streak that was over 18 innings, encountered some tougher games later, was demoted, ran down a bit towards the end of the year, and is no longer a starter in 2019.Moreover, he has clearly been thrust into a reliever role that he has never been in during his minor league career, and is an afterthought behind Littell, Gonsalves, and even Stewart (who pitched better than the previous two) only 1/2 later.What could they have possibly seen to change their opinion of Romero, while still holding the other 3 as better long-term starters.If it is diversity of pitches, I'm sorry, but simply having a few more pitches that are woefully ineffective just does not project as a better starter.Moreover, the Twins don't do a great job utilizing young relievers, as they would rather recycle old retreads versus promote younger pitchers.How does anyone validate what the twins are doing with Romero - I just don't get it. I know about the sites that projected him as a relief pitcher in past years.However, after 3 (2 very) quality starts last year, and a few clunkers as a rookie - they are throwing in the towel this year as a SP?! ?For potentially Gonsalves, Littell, or Thorpe (I think Stewart will be solid this year)?On what MLB basis would that judgment be made?I witnessed ALL of his starts, and those of the other rookies, and he was MILES ahead of them in terms of stuff, pitchability, stamina, etc.Makes ZERO sense at this stage.May is the closer type that Romero MIGHT be.Romero should be a great complement to Berrios - and he had a much more inglorious set of starts than Romero in his rookie year (ERA around 8).I am not sold on our pitching decisions/projections AT ALL. Really looking forward to seeing Colina and Alcala in the pen next year. Correct... that was always a question... could he develop the changeup? And, now that the TWins feel like they can compete this year - coupled with the inability to add that third pitch - they see how valuable he can be using two really, really good pitches out of the bullpen.